The decline of two giants of industry in the West Midlands has proved to be the platform for a growing, high-tech firm. Embed was formed out of the collapse of car firm MG Rover by two founders, including current director Derek Hoyle and his colleague Ian Kirwan, in 2005. The premise behind the company was to offer embedded software systems for the automotive industry, based on their expertise and experience from the car company. Embed’s software can be used in everything from heating systems to fault diagnosis within vehicles and the success of the business has seen it grow considerably over the course of a decade. Since its inception, the company has been based at the University of Warwick Science Park – beginning in the Venture Centre. It formed on the back of help from the Science Park’s Fast Start initiative, a customised development of a longstanding Science Park start-up programme, which was funded by Advantage West Midlands as a direct response to the fall-out from Rover. Following that, the company received help from the Science Park’s IGNITE programme which helps to nurture new and young businesses. This support has helped the company to grow – it’s now turning over more than £1.1 million, employs 24 people and moved to new office space at the Viscount Centre at the University of Warwick Science Park at the start of 2016. The growth has led to local recruitment from a range of places, including Ericsson, following the closure of its research and development facility at Ansty Park. Ivan Wilson, a director at the company, said: “The skills base in this area has been good for the growth of the business. “Obviously, there was huge disappointment with what happened at MG Rover but Derek and Ian saw what was coming. They knew that they had the skills and the knowledge to set up on their own – which is what they did with Embed. “The Science Park was a massive help at the time – not only in providing space but also support. It was definitely a big part in getting the business established. “Also, having this as a base looked good when we were meeting clients – we are a high-tech, knowledge-based company and the Science Park name adds to that. “As we’ve grown, we’ve had to tap into the skills the area has to offer. The pool is becoming shallower but Ericsson, another big name in Coventry, was another that left behind talented engineers and we’ve taken on six or seven from there. We would take more, Ericsson really trained their engineers well. JLR is a significant client but the firm is also growing its overseas customer base – particularly in Germany and the USA. Exports now make up around 15 per cent of its business and could rise to 20 per cent soon. Its new offices, too, leave room for more growth. It has a capacity for 31 staff and Ivan believes that they will expand sufficiently to fill it in the next two years. “There are other sectors we are looking at,” said Ivan. “Rail being one of them. Our technology can be transferred into any vehicle but the rail sector provides the best opportunity for us to diversify. “We have looked overseas as well and have worked with the likes of UKTI to help grow our export market. You become vulnerable if you are over reliant on one market or sector. 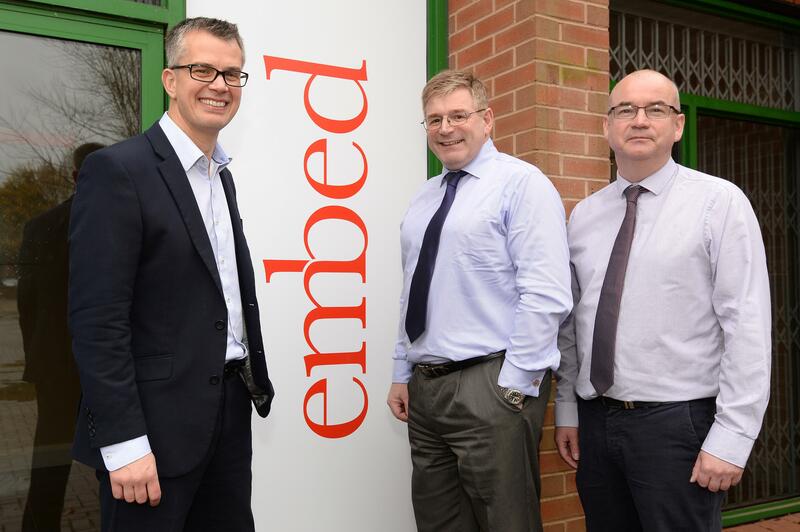 “We’ve had to move with the times too – cars have changed dramatically in the time since Embed was established and that has led to new opportunities for our technology. “So it continues to be a learning curve in terms of the business – and we’ve had to learn about managing cashflow and actually going out and winning new business. I don’t think any of that came naturally to begin with. “But we believe in what we do and provide absolute quality in all that we do. That’s led to us pushing for ISO 27001 for cyber security because that is something else clients now expect us to be hot on as we are holding business sensitive information.